Well-established research confirms that quality in early education programs depends on responsive staff trained in child development who are resourced and valued for the work they do. This part of the ECE Report looks at progress in this area. Is there an evidence-based curriculum to guide the work of educators? Is it aligned with the school system to support children’s transition into school? Are educators in all ECE settings trained in early childhood development?Are salaries and recognition reflective of the important work educators do? Children move from preschool into kindergarten at different ages and stages of development. The kindergarten and early childhood curriculum frameworks should align to reflect this. A curriculum review populated in Table M2 determined if ECE policy addresses this issue. Child/staff ratios across jurisdictions are quite similar, but the number of qualified staff required by policy or regulation varies widely. For this benchmark, qualified represents the period of post-secondary training that provincial regulation considers necessary to be recognized as a qualified staff member in an ECE setting. It is acknowledged that ECE qualifications are not standard across jurisdictions. UNICEF recommends at least 50 percent of staff have three or more years of post-secondary training, and 80 percent of staff working directly with children have postsecondary training in child development. No Canadian jurisdiction meets this standard. For this benchmark, two-thirds of staff must a have a minimum of one year of postsecondary level training in early childhood development (Figure M4). Public kindergarten is the dominant form of ECE provision. For many children it will be their only preschool experience. Quality in ECE settings depends on educators trained to understand the developmental needs of young children. A review of provincial policies determined if ECE training is required for educators in kindergarten classrooms. 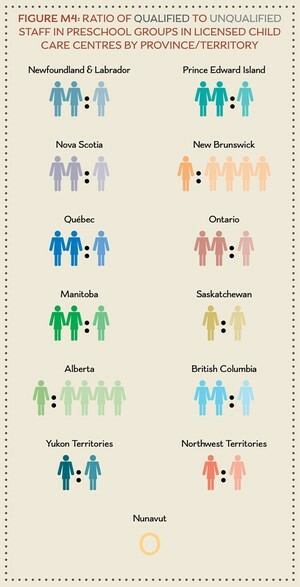 For example, Prince Edward Island requires kindergarten educators to obtain a teaching certificate with an ECE specialty. Ontario was recognized because its legislated staffing model for full-day junior and senior kindergarten requires at least one staff member to be a registered ECE. ECE certification is an acceptable qualification to teach junior and senior kindergarten in the Northwest Territories. Low compensation levels for early childhood educators are recognized in the literature as contributing to recruitment and retention challenges, which in turn impact the quality of ECE programming. The compensation gap between elementary school teachers and early childhood educators reflects the challenge. These issues become more evident as early childhood educators move into school settings to work alongside teachers. This benchmark looks at the salary gap between teachers and early childhood educators by jurisdiction as an indicator of the relative value placed on the professions. In previous editions of the ECER, the teacher salary was selected from the top of negotiated salary grids. However, this is not representative of most teachers. The rates for 2017 report were therefore obtained from current provincial/territorial collective agreements and compared to findings from the Statistics Canada Job Bank (2016) and median salaries supplied by a custom run from Statistics Canada (2016) for full-time teachers with university degrees. 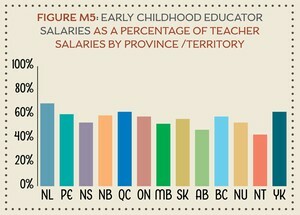 Early childhood educator salaries were obtained from government sources. Manitoba’s ECE hourly wage was obtained from the Manitoba Child Care Association. Where information was not available, a custom run of the Labour Force Survey provided 2016 hourly wages for selfidentified early childhood educators with post-secondary qualifications who are employed in the sector. This was used to estimate full-time annual salaries (40 hours x 52 weeks). The two-thirds benchmark reflects a salary gap between the two professions based on differences in educational and professional requirements (Figure M5). 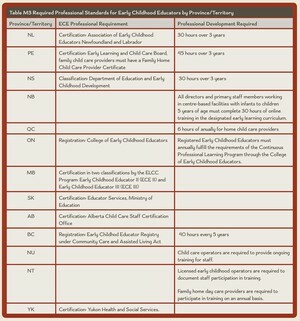 Registration, certification and classification are all processes that provide official recognition for an early childhood educator and enable the registrant to work in an ECE program. These processes are proxies for the value placed on the profession. Ongoing professional development is critical to maintaining a workforce that is knowledgeable about current child development and educational practice and is closely associated with high-quality early childhood settings. 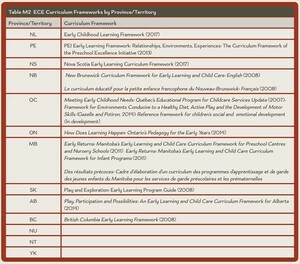 The benchmark reflects provincial policies requiring professional certification as a condition of practice and/or regular professional development as a condition of maintaining good standing in the ECE profession (Table M3).